Not to be confused with Bay of Biscay or Biscay Bay, Newfoundland and Labrador. The North Bay of the Biscayne Bay lies between Miami Beach barrier island and Miami on the mainland. It has been severely affected over the last century by raw sewage releases, urban runoff, shoreline bulkheading, dredging, the creation of artificial islands and the loss of natural fresh water flow into the bay. However, water quality has steadily improved since regular monitoring began in 1979. North Bay accounts for only 10% of the water area of the bay. Central Bay is the largest part of the bay. It is separated from the Atlantic Ocean by the Safety Valve. It has been adversely affected primarily by bulkheading, urban runoff discharged by canals, and the loss of natural fresh water flow. South Bay is nearly as large as Central Bay, and is the least affected by human activities, although it also suffers from the loss of natural fresh water flow. South Bay is separated from the Straits of Florida by the northernmost of the Florida Keys, and includes Card Sound and Barnes Sound. It is connected to Florida Bay through a few small channels. The first bridge across Biscayne Bay was the 2.5-mile (4.0 km) wooden Collins Bridge built in 1912 by John S. Collins and his son-in-law Thomas Pancoast, who formed the Miami Beach Improvement Corporation; financing was provided by Carl G. Fisher and the Miami banker brothers John N. Lummus and James E. Lummus. Construction began on July 22, 1912. Although the cost of the project was initially $75,000, the construction project faced delays and cost overruns. The budge was partially completed in 1913. The bridge was "hailed as the longest wooden vehicle bridge in the world, and opened up the area as a luxury winter resort and playground." The bridge terminated at the Dixie Highway, built by Carl G. Fisher. The bridge was a toll bridge; in 1920, the toll was reduced from 20 cents each way (for two-seat cars) to 15 cents one way (and 25 cents round-trip). The bridge was sold to the Biscayne Bay Improvement Association, which developed five artificial islands that became known as the Venetian Islands: Biscayne and San Marco in Miami, San Marino, Di Lido, and Rivo Alto in Miami Beach. The bridge was torn down in 1925 and replaced with the "more substantial" Venetian Causeway the next year. The Lummus brothers lobbied for the county commission's support for a second causeway connecting Miami to the barrier islands of Miami Beach, and the County Causeway—later the MacArthur Causeway—opened on February 17, 1920. In 1925, Biscayne Point was created in Miami Beach's north end. In 1929, a third causeway crossed Biscayne Bay at Normandy Isle, which developer Henri Levy had created several years earlier by dredging and filling the south half of Meade Island. The Julia Tuttle Causeway was built in 1959. Other causeways are the John F. Kennedy (79th Street) and Broad causeways (connecting the Miami mainland), and the Rickenbacker Causeway (connecting Miami to Key Biscayne). The Card Sound Bridge connects the mainland in the Homestead, Florida area to the northern part of Key Largo. In 1975, the bay was designated as a state aquatic preserve. The aquatic preserve spans the entirety of Biscayne Bay from Oleta River in the north to Card Sound in the south, with the exception of the central part of the bay, which is Biscayne National Park. A second preserve was soon added off of Cape Florida on Key Biscayne, which became known as the Cape Florida to Monroe County Line Preserve. These two preserves are now managed by the state of Florida under the Biscayne Bay Aquatic Preserves. Seven remaining houses of Biscayne Bay's Stiltsville settlement are now within the boundaries of this National Park which was established in 1980. Much of Biscayne National Park was designated as a National Monument in 1967. Barnes Sound lies within the Florida Keys National Marine Sanctuary. In regards to wildlife, bottlenose dolphins and Florida manatees can be observed in the bay. The bay has been known by several names. Juan Ponce de León called it Chequescha in 1513. Pedro Menéndez de Avilés called it Tequesta in 1565. The British, during their occupation of Florida, called the bay Cape River, Dartmouth Sound, and Sandwich gulph. 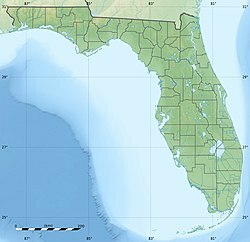 Hernando de Escalante Fontaneda related that a sailor from the Bay of Biscay called the Viscayno or Biscayno had lived on the lower east coast of Florida for a while after being shipwrecked, and a 17th-century map shows a Cayo de Biscainhos, the probable origin of Key Biscayne. The bay was known as Key Biscayne Bay in the 19th century, finally shrinking to Biscayne Bay late in the 19th century. The bay is also home to the University of Miami Rosenstiel School of Marine and Atmospheric Science in Virginia Key (founded in 1947) and Florida International University's Biscayne Bay Campus (founded in 1977) in North Miami. It was seen in the music video for The Lonely Island's "I'm on a Boat". The Safety Valve is a series of shallow sand flats separated by tidal flow channels, stretching about 8 miles (13 km) from the south end of Key Biscayne to the Ragged Keys at the north end of the Florida Keys. The term "safety valve" was applied to the tidal flats by Ralph Munroe, who argued against building a causeway and bridges connecting Key Biscayne to the Ragged Keys and beyond on the grounds that such construction would block the free outflow of storm surges from the bay across the flats to the ocean. It is believed that it does moderate the effects of storm surges on the bay. The transportation of sand southward along the Atlantic Coast of Florida by longshore drift ends in the area of the Safety Valve. The structure of the Safety Valve has been stable for at least the last century. Stiltsville is a collection of buildings on pilings on several sand flats at the northern end of the Safety Valve. ^ a b "Discover Biscayne Bay, About the Biscayne Bay". Retrieved 2011-08-10. ^ a b Blank, p. 159. ^ a b c d Whitaker, p. 133. ^ a b Reilly, p. 33-34. ^ a b c d e Klepser, p. 24. ^ Blank, Joan Gill. 1996. Key Biscayne. Sarasota, Florida: Pineapple Press, Inc. ISBN 1-56164-096-4. p. 13. ^ Leynes, Jennifer Brown and David Cullison (January 1998). "Biscayne National Park: Historic Resource Study" (PDF). U.S. National Park Service. p. 8. Archived from the original (PDF) on April 14, 2013. Retrieved April 9, 2019. ^ Parks, Arva Moore (1977). The forgotten frontier: Florida through the lens of Ralph Middleton Munroe. Miami, Florida: Centennial Press. p. 178. ISBN 0-9741589-2-5. ^ Thornberry-Erlich, Trista L. (February 9, 2005). "Biscayne National Park Geologic Resource Management Issues Scoping summary" (PDF). U.S. National Park Service. p. 12. Archived from the original (PDF) on May 11, 2017. Retrieved April 9, 2019.